Tinder Without Facebook: Tinder(Dating App): Most of us are familiar with Tinder and have used it for some time and still using currently. With Tinder we can do a one-to-one chat with a person of our area with mutual interest. Tinder is really popular and has received highest rating amongst all available dating apps. We all know that we require to login with Facebook on Tinder. Now what are the losses to that? You can accidentally allow Tinder to display information on Facebook and it is really haunting if all of your Facebook friends come to know of your dating life. So if it haunts you too then this post is definitely for you as we gonna tell you How to Use Tinder Without The Interference of Facebook. Also check Top 10 iCloud Bypass Tools to Remove iCloud Activation iOS(iPhone/iPad). Use Tinder Without Facebook | Why is Tinder Linked to Facebook? Before going ahead to the main agenda let us discuss as to why a Facebook login is required with Tinder. Tinder became most exciting app for youth these days and it deserve this attention. Tinder App Apk is one of the popular social media application to meet our loved ones. Let’s have a some quick glance on why tinder linked to Facebook and ways to use Tinder Without Facebook. First reason can be that it creates a shield against abuse as when we are required to login with Facebook there is hardly any chance of faking ourselves. So this shielding makes users use the app and trust it. Since we have already uploaded photographs on Facebook so Tinder automatically gets the photos and we don’t need to do any kind of additional settings after logging in and straightaway use the app. Also the app will ask as to whether it can access your contacts. If you give ‘Yes’ as an option then automatically your Facebook contacts are synced and scanned and this increased the prospective of familiarity. 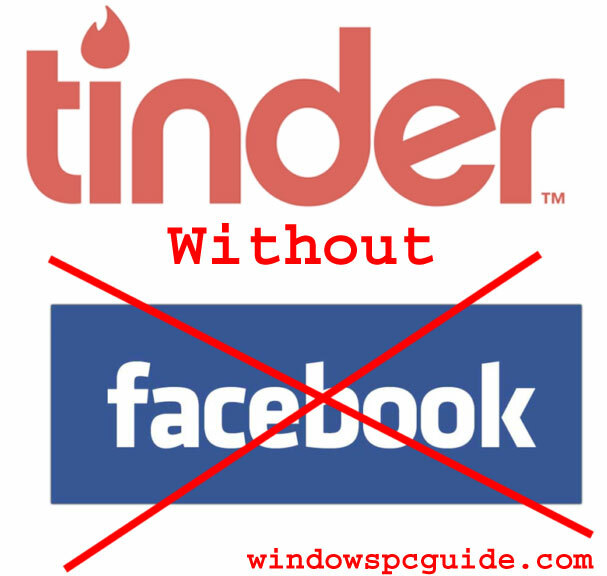 Use Tinder Without Facebook | Why We Should Un-link Tinder from Facebook? First of all in nowadays hacking era anybody can hack any app and get the required information from it. So it’s definitely not wise to link Facebook account with Tinder as it can have grave consequences if in case the app gets hacked. We really don’t want apps snooping around our photos, contacts. Privacy is mandatory. ♥♥♥ Best Way to Install Two WhatsApp Accounts in One iPhone/iPad & Android Devices. When you login to Facebook you are required to navigate to Settings (Lock Icon) and inside that you are required to go to Apps Section. Under the Apps Section you will be able to see Tinder. Click on it. Thereafter make the App Visibility to Only Me. This is the best method for doing the needful. All you gonna do is that create a new Facebook account which is not known to anyone. Thereafter Login to Tinder with the new Facebook account. Don’t forget to make the App Visibility change as described in the first method. That’s it. Now your Tinder account will be associated with your new Facebook account which is not known to anyone except you. Conclusion: Tinder Without Facebook Update – Whats New ? So that’s it folks regarding How to Use Tinder Without Facebook. In case we come up with a new method or an update we will definitely update this post. 5 Ways to Bypass Online Surveys for Free, Skip Popup’s & More. How to Recover Deleted WhatsApp Images/Pictures from Android & iOS Devices. In case you have any queries please feel free to drop them in the form of comments below and we will get back to you with an answer to your query and Happy Tinder Without Facebook 🙂 <3 😉 .